If your skin is looking less than its best, then a mask could be the perfect solution to get things back on track. Masks are one of the best beauty ways to give your skin a quick boost of nutrients to make it look more vibrant and alive. They're like a part time PA for the skin: they make your skin's life easier and you only need use them once or twice a week. Here's a few of the best by organic beauty brands, all of which have our stamp of approval. Ultra Purifying Mud Mask by Madara - one of the So Organic teams favourites, all skin types should love this deep cleansing mask. It contains lavender, algae & olive extract combined with mineral rich kaolin clay to help draw away surface debris and impurities that can clog pores. Dull and tired complexions are left revitalised. Revitalising Mask by Dr Hauschka - one of our customers favourites this mask helps the skin with pore elasticity. It contains carrot and borage extract, which calms sensitivities as well as being deeply moisturising. People find it reduces the visibility of open pores and tones beautifully. Pink Clay Mask for Sensitive Skin by Lovea - The perfect solution to calm and cool sensitive skin. It's designed to cleanse gently whilst caring for super sensitive skin. It contains pink clay, shea butter and aloe vera and should be rinsed off before its had time to dry. 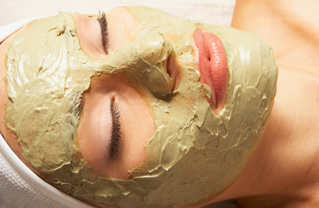 Anti Ageing Vitamin Mask by Green People - the mask is a skin-booster for drier, mature skin. A non-drying moisturising mask that doesn't make your skin feel too tight. It contains mandarin, seaweed, and avocado oils as well as rosemary, famed for it's antioxidant properties. The skin feels hydrated, smoothed and revitalised after using this mask.